I'm thinking about using my sprint sled with the Shibas for winter exercise and some fun in the snow. Because of the curly tails, I'm thinking about freight harnesses for them rather than the typical race harnesses. I think I'll end up running behind the sled with them with only occasional down hill rides and kicking. Anybody ever try this for fun? I think my three will think it's a blast. I have ski-jored, but not used a sled, but that was with my Akita I had years ago when I still lived in Alaska. How big are your Shibas? They're pretty small even for sprint dogs, if they are standard sized. I mean, I guess it doesn't matter if there is nothing on the sled....but it's kind of hard to picture little Shibas pulling a standard sized dog sled (even the sprint sized). But maybe you have some supersized Shibas? (My girl is 32 pounds, so I could kind of see it with her size). I can't really remember the difference between the freight harnesses and race harnesses--I think what I'm thinking of is race harnesses. What would the advantage to the freight harness be? Now I get it! No advice though, since like I said I can't even remember the difference between the types of harnesses. Two of mine are well within the breed standard, one is bigger. I used to skijor with my Akitas years ago, too, like in the early nineties. Back then, I used padded carting harnesses on the Akitas for dog skiing. My sled weighs about 25#, I can pick it up with one hand, it's really light and small, it's a sprint sled, and I'm just thinking of playing around on my own property, nothing for competition. Sorry about the curly tail confusion, I was thinking that because of where the race harness ends, just at the area on the back where the tails rest, I would use a freight harness because there is a spreader bar and the attachment is behind their butts and also places any load lower. These harnesses are to be custom made for each of the Shibas for ultimate comfort. My dogs are very active and get to do a lot of stuff, like going on the kayak with me, swimming, showing, agility, biking. So, they are used to flotation vests, visibility vests and harnesses as well as doing a lot of activities. I don't think there will be a lot of load, as I'm not thinking about making them pull me around and break trail in waist deep snow. (not like the grinch on the sleigh and the poor little dog with the reindeer horn strapped on it's head on the way to whoville) There would be a packed and groomed trail for these outings. It's more for group exercise and general fun in the snow. It sounds like fun. Just be careful about weight pulling. Shibas typically have such poor layback and straight upright shoulders that lots of pulling in harness can cause bone bruising. I would use the spacer. There is a good dog scooter site that has some good harness options for the type of work you want and the type of dog you have. If the equipment is good and size appropriate and the dogs are in good shape and not pushed too fast, why not? I think their curly tails won't be too affected. 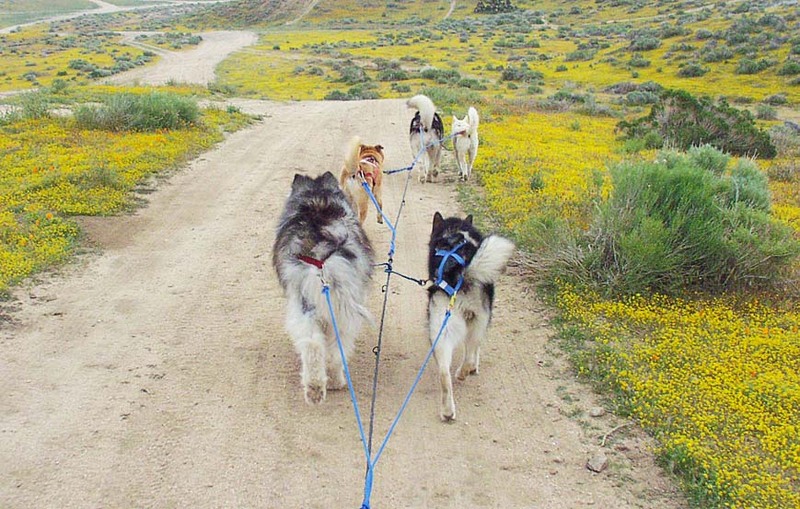 Here's a pic of some Malamutes and Jindos carting and only one has the harness centered so that the tail is kept down.